It was a place to stop and stretch your legs while on the way to the Grand Canyon, California, Chicago, or some other faraway place. You could have a cup of coffee at Miz Zips or another local diner, fill your tank with gas, or even spend the night in one of the seemingly endless supply of motels arranged like dominoes along the main route through town. If you limited your vision to Route 66, with motels, eateries, gas stations, and bars lining one side of the road while the other side featured billboards and the train tracks, Flagstaff wasn’t a very exciting place to be. It was nothing more than a wayside stop on the way to someplace else. But a special magic was awaiting those who could expand their vision and linger long enough to leave the deceiving main street and discover the real beauty of the area. These were the people who were enticed to return again and again. These were the people who deserted long commutes and good-paying jobs in smog-clogged cities to experience a different style of living. They discovered the town’s potential as well as its limitations. They were the people who have made Flagstaff the city it is today. Flagstaff is not an old town. In history’s grand perspective, it dates only to yesterday. Born of a railroad in the late 1800’s, it is still tied to one. Before the railroad came, this was just another pine-covered wilderness generously endowed with trees, bears, deer and elk. The railroad created the town but a group of travelers provided the name. The men who came first were not builders of a city. They were simple sheep herders in search of water for their flocks during one of California’s severe droughts. Finding water, they built a cabin near one of the springs in the area. The year was 1876, our country’s 100th birthday. Travelers arrived, on their way to somewhere else and were invited to stop and rest. Deciding to stay and celebrate the 4th of July, they stripped a tall pine tree of its branches and ran up the American flag. Once the holiday was over, the flag came down and the immigrants left, but the bare flagpole remained. In 1882 the railroad, inching its way across the country, arrived along with its workers, hangers-on, and those who made their living providing supplies and services. A sawmill was built to supply the railroad with wooden ties. The place needed a name and someone suggested Flagpole. Someone else said, “Flagstaff sounds better.” They agreed and Flagstaff was born. The city continued to grow and diversity. Today its citizens feel it’s got just about everything larger cities have– including franchise businesses, the big-box stores, and traffic jams. The city’s backbone is still the Burlington Santa Fe Railroad, which separates the town into north and south. The lumber mill, once one of the primary employers, no longer exists. But Flagstaff still retains that elusive magic which entices the visitor to linger for a day, a week, or even a lifetime. 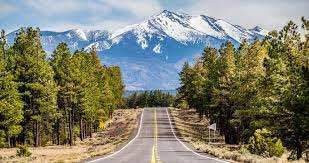 Nestled at the base of the age-old San Francisco Peaks and surrounded by the world’s largest Ponderosa pine forest, the state’s third largest city provides a striking contrast to the cactus-clad desert that makes up much of the state. When you leave, you’ll take a bit of that magic along with you. Wherever you go, the experiences, the memories, and the pictures etched in your mind will make Flagstaff a permanent part of you. But, if you happen to be one of those lucky ones who return to stay, leave the big city and all its problems behind you. Enjoy the blessings of living this close to heaven and always remains a tourist at heart. I first traveled through Flagstaff as a young bride 57 years ago on my way to a future life in California with the man that I am still married to. I was impressed but considered the first snow-covered mountain that I had ever seen as a one-time experience. As our lives together progressed and we lived in various California Forest Service communities, we did pass through this magical town several Our childwith our two daughters on our way to and from Florida to visit my family. Still impressed, I still considered it a bit of magic to be enjoyed and left behind. In 1980, my husband was offered the opportunity by the US Forest Service to transfer to this magical community. Our children grew up here, attended the local university, and still make their lives here in northern Arizona. The town has grown and changed through the years as the university has taken over the western side of the community. But the magic of the mountain and the forest surrounding it are no longer memories but are a permanent part of our daily life. And we hope to never leave.